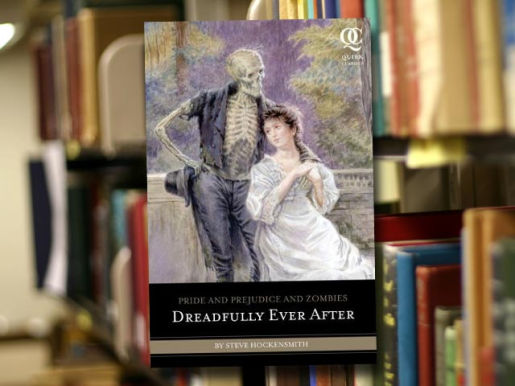 Pride And Prejudice And Zombies: Dreadfully Ever After--a fixture in every family library! As part of my ongoing collaboration with Quirk Books and Irrefference, I’ve been lucky enough to get my hands on an advance copy of Pride and Prejudice and Zombies: Dreadfully Ever After. It’s the latest and greatest in the zombie-slaying adventures of the Bennett Sisters, only this time with even more courtly intrigue and some actual stuff for Kitty to do! I did a full-scale review of Dreadfully Ever After for Den of Geek, but I’ll also share my thoughts briefly here. This book, moreso than any of the other books, inhabits a fully-formed universe. If you’ve ever wondered just how England would adapt to zombies, then this book will tell you that. The Dreadfuls are a fully-accepted part of everyday life, and the smoke-belching factories of the real-world Regency are joined by the smoke-belching crematoriums designed to burn London’s bodies to prevent a dreadful uprising. Dreadfuls are a source of courtly amusement and a fixture of the races. To me, little seems as difficulty as picking up someone else’s idea and adding to it, but Steve Hockensmith is more than up to the task. He’s picked up wonderfully where Jane Austen and Seth Grahame-Smith left off, and he’s injected his own warped humor into the mix to create a wonderfully un-dreadful concoction designed to delight even the most hardened zombie fanatic or Austen acolyte. This is less a literary mash-up and more an original idea, and Hockensmith deserves all the credit in the world for writing a great book.